Radio Server Player 2 - Simple. Professional. Affordable. Radio Server Player 2 is the perfect audio playout tool for internet radio stations, pubs, clubs, party organisers and mobile DJs, where continous music playout and simple control is a must. Radio Server Player 2 incorporates a unique play stacking system, so you are able to queue up to 9 songs, jingles or promos at once. The stack queue allows a clear view of what tracks are still to play and what track is currently playing out. The queue also shows you the track time, intro length and air time, so you know exactly what time of day the track will start. Sweepers can be selected to playout over the intro of certain tracks as required, and the queue can he halted mid-play should an announcement need to be made. The "Auto Halt" feature allows you to halt after every track; making use of "Auto Halt After..." means you can halt in 3 tracks time, for example. 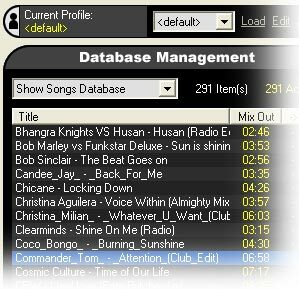 Every track stored in your database can be accompanied by information such as genre, album, release date and other artist notes. At the click of the mouse button, this information can be displayed for your reference. 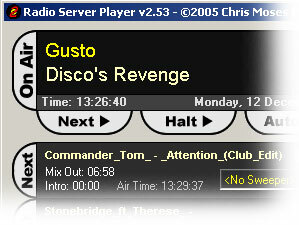 The Radio Server Player 2 counters show critical playout information, including track duration, remaining play time, intro length, sweeper count-in time and track outro type. With a graphical progress bar to change playback position, the controls include "Start", "Stop", "Pause", "Break" and "Next". Radio Server Player 2 can also act as a "virtual DJ", by starting playout when no tracks are in the queue. It will select tracks at random from the selected genre, inserting jingles, promos and sweepers as required - all this can be set in the advanced options menu. Used in conjunction with RSPSend* you can instruct Radio Server Player 2 to switch genres at certain times of day or fire Carts as required, using the Windows Scheduler. * RSPSend is available as a free add-on from Chris Moses Productions. Please contact us for more information. All audio tracks are conveniently placed in the centre of the player, so you can quickly search your database of files, edit single items and arrange items by name, track length and even addition date. Tracks can be dragged from here to the play stack with ease. Adding new items to Radio Server Player 2 couldn't be easier too! You have the ability to add single items or groups of items and even drag in audio files directly from Windows Explorer. Radio Server Player 2 currently supports: WAV, MP3, AAC, OGG, MP4, WMA and WavPack audio formats. Do you require mutiple users of your playout PC? Not a problem! Radio Server Player 2 features user profiles. Each user can have their own set of options, Genres and Carts, while still maintaining full access to the main system database of Songs, Sweepers, Promos and Jingles. Providing no major audio settings have been made between profiles, you can seamlessly switch to a new profile without affecting the audio playout! Radio Server Player 2 allows you to instantly fire sound effects, jingles, promos, sweepers or even songs, by clicking them in the Cart Manager. Clicking once plays the item, clicking again stops the item with a fade out (if required). You are able to have "One Time Only" Carts, "Looped" Carts and "Solo" Carts. The Loop points of a Looped Cart can be fully customised too. Again, the addition of items to the Cart Manager is a simple case of dragging them from your database library or Windows Explorer; it's that easy. 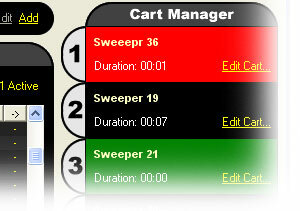 A duration counter will show you the exact length of the Cart or customised Loop. Multiple Carts can be fired at once or Carts can be configured to play "In Solo". Radio Server Player 2 currently allows up to 45 Carts on 5 pages. Radio Server Player 2 incorporates an audio processing system that ensures your playback has a "punchy" sound and remains as level as possible at all times. Adjustments to playback volume are made automatically to keep the music level equal - this eradicates severely loud or quiet sections in the playout. Advanced control over the audio settings are available in the options menu. Radio Server Player 2 has support for multiple soundcard systems. One soundcard, for example, could be set up to playback the music, while another can be set up to playback the Cart audio. A third soundcard can be introduced if you wish to "monitor" the music tracks in your library before they are aired. All these features and many more, for only �69.99! Web Design ©2013 Chris Moses Productions. All Rights Reserved. http://www.chrismoses.co.uk/.